Have you ever thought about how often you eat during the day? How much? One time I shocked myself, that I ate something every hour, on the hour, for 12 hours! (talk about a stressful day). When I’m feeling stuffed, sluggish, or fatigued, I know my body is telling me “Hey girl, I need a break!” To reset, I like to incorporate two-week intermittent fasting (IF) period into my daily routine. Intermittent fasting is the process of not eating for a predetermined period. 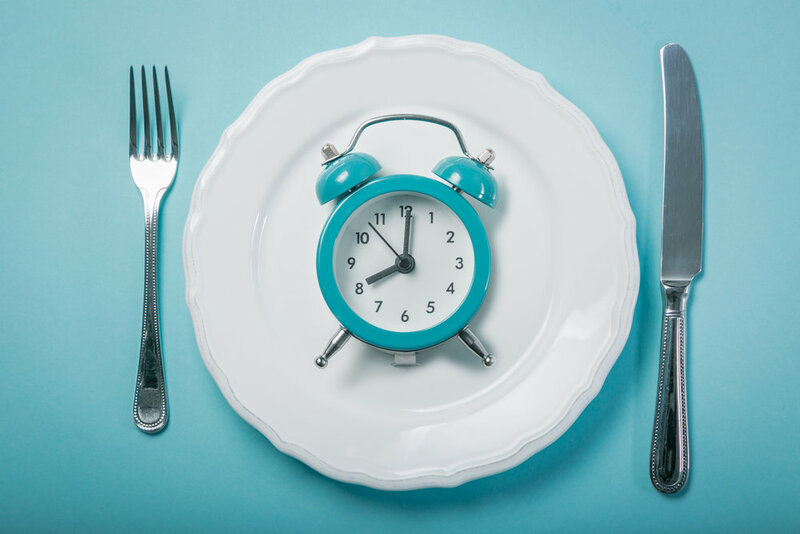 Although the idea of not eating for 16 hours sounds impossible to some, intermittent fasting can help improve digestion, increase energy, decrease bloating, and in some cases help you lose weight. More than anything, we have found fasting contributes to a healthier relationship with food by reconnecting the body and the mind, (Basically, am I really hungry or just bored?). Please note, we are not doctors, so please check with your primary care provider before attempting any fast. 16:8 Method: Here, you fast for 16 hours and eat only during an eight-hour window. When you fast for 16 hours, you are more likely to reap all the benefits of IF mentioned above, but you can also gain the same benefits in the 14:10 method in which you eat during a 10-hour window and fast for 14 hours. This one is usually easier and more manageable for beginners. 5:2 Method: This method allows you to eat as you normally do five days a week. The other two days are considered your fasting days, although you do still eat between 500 and 600 calories. This method is more advanced, so as we mentioned, don’t try this without consulting with a doctor. Choose a plan and times that work for you. My preferred method is the 16:8 method, fasting from 8:00 p.m. to 12:00 p.m. the next day. This is the easiest one to try because I sleep through 6 to 8 hours of the fast! When awake, during periods of fasting I like to drink water, sparkling water (no sodium), and unsweetened tea. The first few days fasting is tough, as your body goes through its own personal detox. Around day three, the body gets a boost of energy, and you actually don’t feel hungry. Plus, drinking more water definitely helps keep the bloat away. Choose a time that works for you, maybe you would do better eating in the morning, so you would fast from 4:00 p.m. to 8:00 a.m. the next day. Be flexible, it may take you a while to figure out what times work best for you. Have you ever tried Intermittent Fasting? Let us know your thoughts below!